Welcome to the big leagues little rabbit. 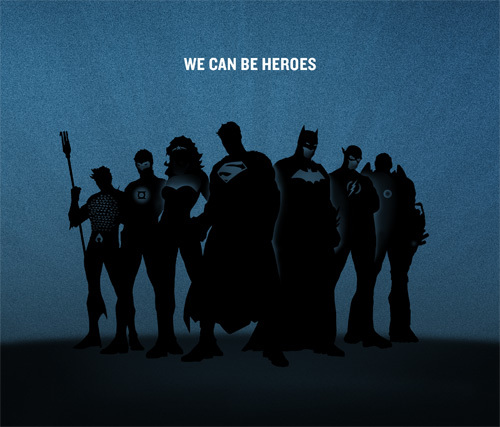 Last week both MTV and CNN reported on a project that I was lucky enough to work on for Warner Brothers/DC Comics while at Studio Jelly: a campaign titled We Can Be Heroes that was created to bring much needed relief to the Horn of Africa. The face of the campaign is not just one, but seven, superheroes. Together they comprise the Justice League, with each superhero representing a trait necessary for the triumph of good over evil. My role working for Studio Jelly was to help set the tone and create initial artwork for the print campaign, shown in the snapshot above. Striking a balance between comic book cool and a cause helping humanity was a good challenge, and I think the end result is both badass and respectful. A short video was also created, directed by Benjamin Reece with creative director Jelly Helm and writer Kathleen Lane. The girl in the red coat is basically me and every other pre-teen at that age, and we’ve been trying to make up for it ever since. Thanks for having me, Studio Jelly. I also want to thank Aquaman, Green Lantern, Wonder Woman, Superman, Batman, The Flash, and Cyborg for standing so still for their group portrait. Barring one small kerfuffle when Superman stepped on Batman’s cape, their composure and professionalism was excellent. I really like this one, really nicely done! no seriously my eyes are welling up and i bought a plane ticket to wherever I’m needed. but more seriously that was great.